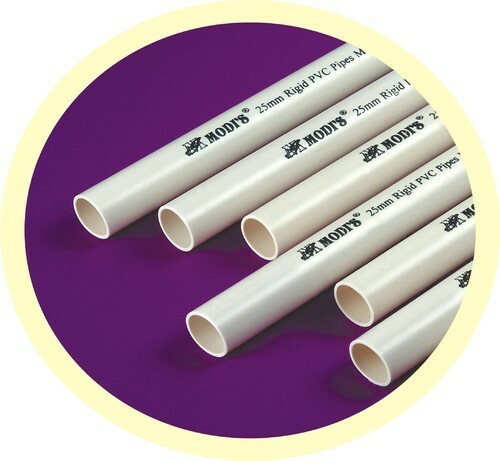 MODI’S Pipes enhances Unparalleled quality and superior safety CONDUIT PIPES The top of the line ‘ Concealed - electrical - wiring’ has become a decisive norm of the day in modern constructions arena. To enhance the safety and security installation process, Conduit Pipes of varied strengths are used to encase the wiring and placed in grooves carved on the brick surface, before the walls and ceilings are plastered and cemented. Since the conduit pipes are invalid, they should remain intact for the life of the building. This phenomenal aspect distinguishes MODI’S from the competing clutter ensuring safety from electrical and fire hazards. MODI’S conduit pipes also stand the test of time against all kinds of weather conditions. MODI’S pipes come in ivory shades and sizes besides providing a hassle-free experience. Manufacturing : Our Company Headquartered in Chennai in the state of Tamil Nadu, and other factories in Jalna & Daman, India, we have a very much active industry working 24 / 7. A very able and dedicated team working in our industry is the most important support our company has. It works all around the clock to serve our clients with our most valuable items.